Traveling Templar: Happy Saint Patrick's Day! Get out your green and grab a beer! It's St. Patrick's Day! Although favored as a day of drinking and celebration, this day is rooted in a Feast Day for Saint Patrick of Ireland to remember this historical figure and the introduction of Christianity into Ireland. 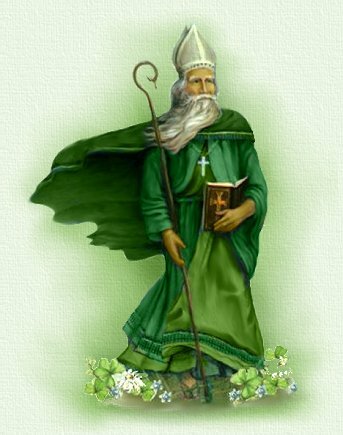 Saint Patrick was a Romano-British Christian missionary and bishop in Ireland, who also is referred to as the "Apostle of Ireland", and is one of Ireland's Patron Saints. He was born around 387 AD, depending on the source, in either England or Scotland, and lived until around 460 AD; it is mostly commonly believed that he died on March 17th for which reason this day is celebrated as a holiday. Much of his early life is unknown, but from two authenticated letters, referred to as Confessio and Epistola, from Patrick that state some details about his life. He was born to Calpurnius and Conchessa who were Romans living in Britain. When he was 16-years old, he was captured from his home in England by pagan raiders and taken to Ireland where he would serve for 6-years as a slave before escaping and returning to his family. He would eventually become a cleric with the Roman Catholic Church and return to Ireland as an ordained Bishop around 432 AD. By the time of the 7th century he would be revered as the Patron Saint of Ireland. The rest of his life is available through sources that are highly debated as they sometimes speak about two Patricks. Some theories suggest that Patrick was known as Palladius who was sent to Ireland to ensure the exiled Pelagians (a Christian sect that denied Original Sin) did not reestablish themselves among the Irish Christians and minister to the existing Christian communities. I saw a man coming, as it were from Ireland. His name was Victoricus, and he carried many letters, and he gave me one of them. I read the heading: "The Voice of the Irish". As I began the letter, I imagined in that moment that I heard the voice of those very people who were near the wood of Foclut, which is beside the western sea—and they cried out, as with one voice: "We appeal to you, holy servant boy, to come and walk among us." Much of the rest of this document surrounds charges levied against him accusing him of financial impropriety (taking gifts and being paid for his ecclesiastical duties) and of course he denied these charges. He also speaks of his missionary work where he converted many, even some of the wealthy classes who still held on to their pagan roots. Christian priests were not protected and often were beaten, robbed, arrested, and executed for exercising their duties. A clan chieftain attempted to kill him, but through his piety he won the pagan over which is said to be near Erin. This place is said to have been location to the first sanctuary dedicated by St. Patrick. This sanctuary would be a common retreat for St. Patrick and a church and monastery that was later built there. Today this place is known as Sabhall or Saul. The second letter known as the Epistola, or Letter to the Soldiers of Coroticus, opens with a declaration of Saint Patrick stating that he has excommunicated Coroticus because he had put into slavery many of Patrick's converts. Coroticus is believed to be King Ceretic of Alt Clut (modern Dumbarton in the West-Central lowlands of Scotland); although this is contested. Some believe that this letter is what provoked the charges spoken in the other letter. Although the theory of two Patrick's causes confusion, modern historians believed that the man that would be known as Saint Patrick died on March 17th, 460 AD in Saul. It is believed, but never proven, that he is buried at Down Cathedral in Downpatrick, County Down (NE Ireland, UK). Neither of the two letters that give details of his life gives dates, but the information therein contained can be dated. Other annals were written, but some of them were either based off of older writings or lost writings so their information cannot be verified or authenticated. Some give the name Cothirtacus which translates eventually into Patricius. Some writings portray him as a martial figure battling against pagans and false idols, but some of these writings contradict his own letters. As I stated above, Saint Patrick was considered the "Apostle of Ireland" as he is credited with teaching the Irish about the Holy Trinity by showing the people the shamrock which he used to illustrate the Christian teachings of 3 persons in one God. This is why the shamrock is a primary symbol on St. Patrick's Day. The shamrock was used in Ireland prior to St. Patrick's adaption by many of the older polytheistic religions. Ireland is well-known for there being no snakes present. Legend has risen to credit St. Patrick with this phenomenon. According to legend, he chased the snakes into the sea after he was attacked during a 40-day fasting. However, it is seen that Ireland never had snakes due to its climate and location in the world. Some believe theorize that the legend is allegorical in that snakes were seen as symbols for druids and that by bringing and spreading the message of Christ, he "banished the snakes from the island". This Feast Day was officially recognized by the Catholic Church in the early 17th century, though it was celebrated much earlier by the Irish. It used to be common practice for people to wear a cross (often made of paper) on St. Patrick's Day; the most common cross associated with St. Patrick was the cross pattée. Originally the color most associated with St. Patrick was blue, but over the years the color green became associated with this Saint, most likely due to the shamrock and St. Patricks use of it to spread religious teachings among the natives. It has grown today to wearing green clothing. St. Patrick has resonated greatly within the Irish culture ranging from traditional folklore and legends to a patriotic and national symbol, particularly in Catholic Ireland. A variety of parades and celebrations are performed on this day, and I hope everyone enjoys this day.